StudioBinder presents our free screenwriting software. Our software guides you through the creation of professionally formatted scripts, and, at long last, delivers a truly holistic production solution. Seamlessly go from development to physical production — all in one hub. Oh, wait… did we mention it’s completely free? StudioBinder’s free screenwriting software redefines the process of concepting, writing, collaborating, and producing your scripts. StudioBinder is the holistic production experience. What do you get with yesterday’s screenwriting software? For decades you’ve been limited to expensive, single-serve software licenses that isolate the writing process from the production team. Most traditional screenwriting software is built around “exporting” your script - be it a proprietary file format or PDF. So... what’s wrong with that? Export out of the writing app. Import into a (commonly expensive) scheduling application. Formatting errors will naturally occur upon import. Every time you make the round-trip from a standalone screenwriting solution to pre-production there’s a risk that something will go wrong. Breakdowns need to be re-tagged. Schedules are lost. Yet rewrites are inevitable, even after pre-production is finished. How do we make this experience better? Put it all in one place. 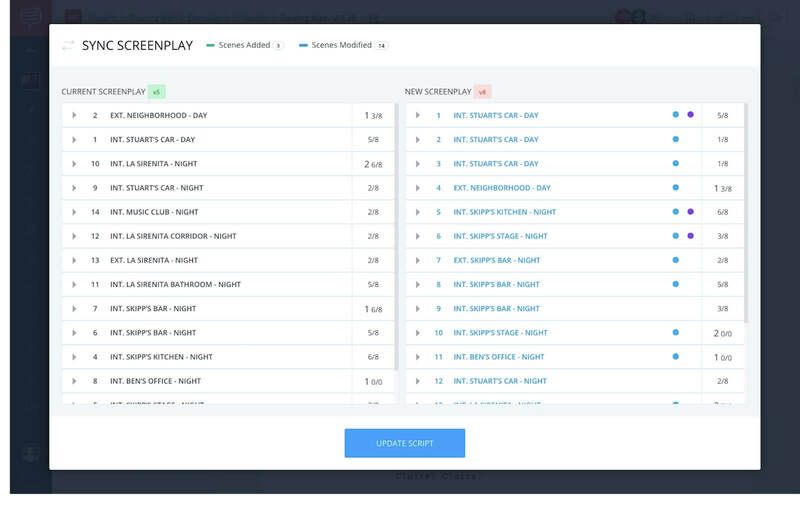 Our screenwriting software is natively baked in with StudioBinder’s production tools. That way, you can collaborate on scripts with producers and your team, and re-sync your updates without losing progress made on your shooting schedule, script breakdowns, shot lists and call sheets. StudioBinder eliminates stress and needlessly redundant tasks. 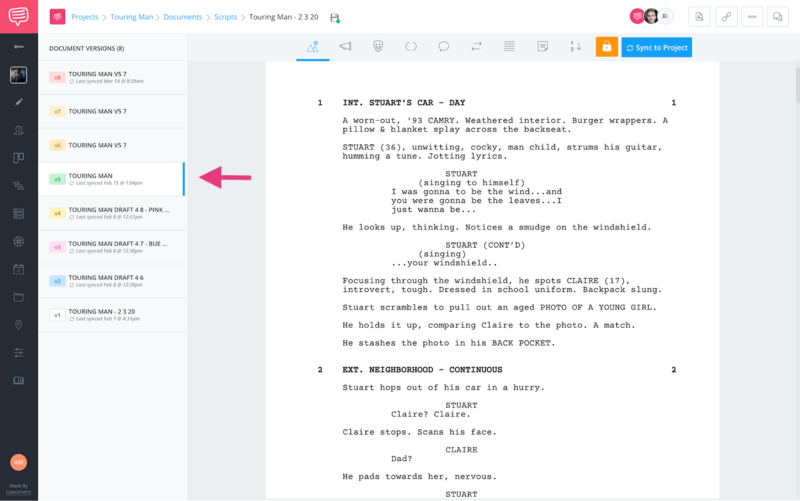 So let’s dive into StudioBinder’s screenwriting software. Let’s say you have a screenplay already started in another solution. Import scripts that were written in your former screenwriting software. They’ll instantly convert so you can continue writing in StudioBinder. This includes formats such as FDX, PDF, DOC, and Fountain. As long as you’ve formatted the script by industry standards, all of your progress will be retained — so that you can quickly continue writing. It should step aside so that your creativity continues to churn. So we added all of the predictive features that speed up your workflow. Script margins and fonts are auto-formatted to industry standards. INT/EXT, time of day, transitions, characters, and more. Keyboard shortcuts and smart-tabbing will allow you to move even faster. We frequently auto-save in the background, so your work is always safe. Regardless of your experience level, you’ll be able to transform your stories into professionally formatted scripts — at lightning speed. Do you wish you didn’t have to juggle script notes? How about circumventing laborious steps just to collaborate? Write your scripts with a partner, team, or from multiple computers. You won’t have to worry about your files being saved securely. StudioBinder’s integration makes everyone’s job simpler. You’ll have the ability to give and receive notes that are directly attached to the script so that they are readily visible while the writer tackle new drafts. You’ll clearly know which portions of the script need improvement, who submitted which notes, and you’ll gain the ability to monitor progress. Gain complete control over the modern script writing experience. That’s a ton of organization and unnecessary printouts. Can’t someone make versioning easier and less wasteful? It’s never been easier to quickly duplicate a script and assign industry standard version colors — then, safely share specific versions digitally. Still need a PDF or printouts? No problem — we give you options. Plus, total visibility and organization of your script versions. No more juggling script files. Writing scripts in StudioBinder is the direct path to pre-production. Sync your script with the click of a button. Prelim shooting schedule complete with scene strips. 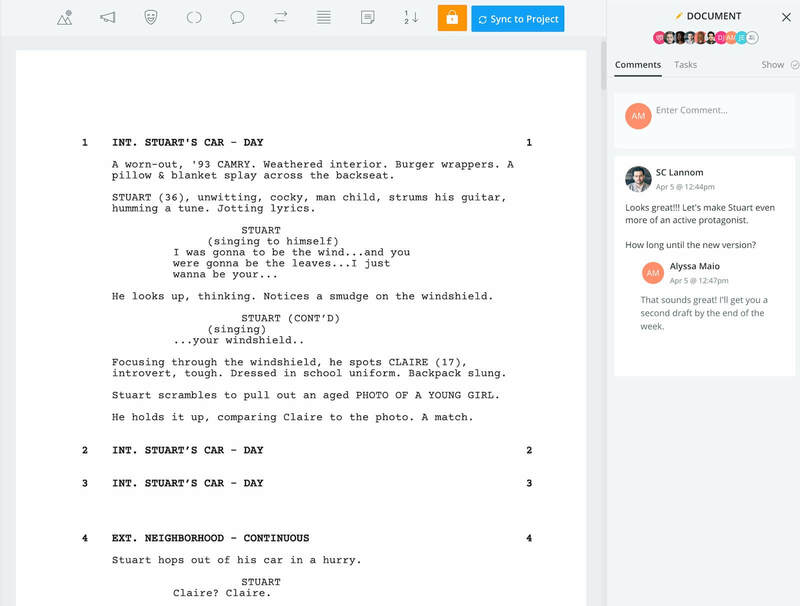 Scene shot lists that let you preview the script while you ideate. 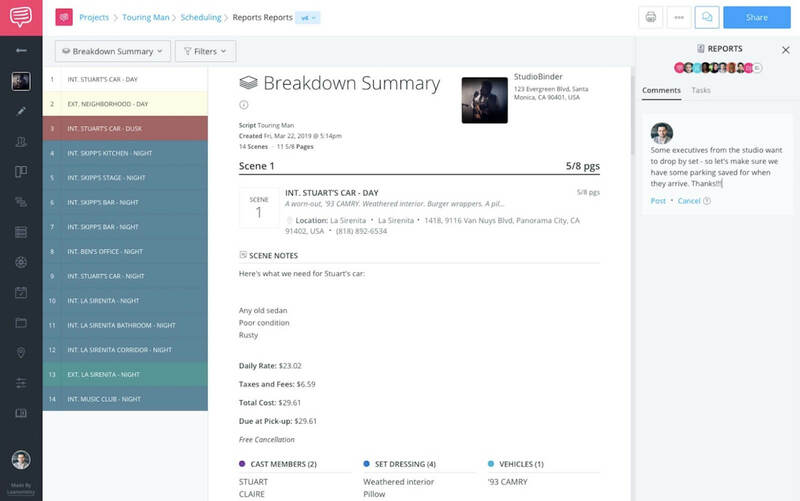 Living reports that update seamlessly during your script breakdown. You’ll begin the pre-production process earlier, and already be further along so that you can focus on creative and complex planning decisions. One of the most frustrating parts of pre-production is adjusting your progress when changes are made to the script. This results in a mountain of redundant tasks for you and your team. Changes to your script instantly update across each of your features. This workflow ensures complete accuracy as your script evolves. The update window provides a clear visual record of which scenes have been changed or reordered in your script — eliminating uncertainty. Your progress will be maintained despite any changes. Need to show the script to someone that isn’t part of your team? To watermark and share secure script files requires multiple programs. StudioBinder climbs that obstacle with ease. Track the view status and count for each recipient. Send all of your necessary production documents — from one place. That time you save can be spent on your creativity. Do you want your production company to go green? StudioBinder is better for the environment — across the board. Virtually eliminate the need for printer paper. When a tree is cut down, the stored CO2 escapes into the atmosphere. Those logs that formerly photosynthesized CO2 into oxygen are now loaded onto trucks so they can be transported — which means fuel. Fewer pages in the recycling bin. Fewer trips to the office supply store. Did we mention how much time and money you’ll save? Both of your mothers will be very proud of you! Thank you for taking time out of your day to read our post, and providing the opportunity for the team to share our screenwriting mission with you. Want to learn more about production planning? Understanding how a production team performs a script breakdown will make you a better screenwriter, a better director, and a better filmmaker. Not to mention.... a better team member.Learn about the process of a script breakdown firsthand, and see how StudioBinder’s feature integration streamlines content production. Check it out!